View from the east of St Nicholas', the parish church of Brighton, which is situated on a hill outside the old town. Daniel Defoe visited the town in the early 18th century, noting "Bright Helmston, commonly call'd Bredhemston, a poor fishing town, old built, and on the very edge of the sea". The parish church was built of flint in the 14th century and has a low embattled tower. It was drastically restored in 1853. 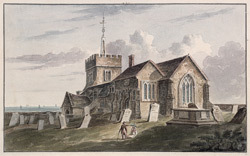 The artist, John Hassell (1767-1825), was a drawing master and a prolific author, illustrating his own local guidebooks and publications on watercolour technique.